Matthew Macklin pictured at Croke Park on Wednesday. BIRMINGHAM-BORN, TIPPERARY by the grace of God, or Lar Corbett. Matthew Macklin was at Croke Park, on Wednesday, in the company of the Tipperary hurling star to promote his upcoming WBC title eliminator against Argentina’s Jorge Sebastian Heiland. The fight will not emulate Muhammad Ali’s 1972 fight at GAA headquarters, rather it will take place at the National Stadium on 30 August. Eddie Hearns’ Matchroom Boxing is trumpeting Mack the Knife’s upcoming bout and have pencilled in a November date at the O2. 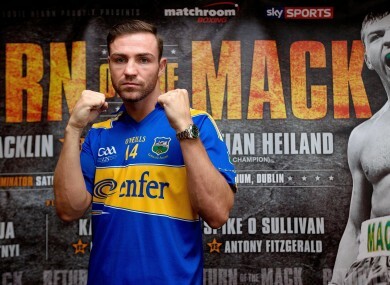 The hope is that Macklin, who’s mother is from Tipperary, would take on WBC champion Miguel Cotto at the venue. Still, given the recent, knock-out form of fellow middleweight Andy Lee, Macklin faced a few questions about taking on the Limerick native. “[Lee] does need me more than I need him. There’s a lot of big fights out there for me. A full interview with Macklin will be broadcast on the stations’s Now That’s What I Call Sport show from 9am this Sunday. What is CrossFit and is it worth the money? Email “'He needs me more than I need him' - Matthew Macklin on possible Andy Lee bout”. Feedback on “'He needs me more than I need him' - Matthew Macklin on possible Andy Lee bout”.